The term E-invoicing has been buzzing around for several years, fired by the Tax Simplification Act 2011 and the ZUGFeRD standard of the Forum elektronische Rechnung Deutschland. Word has got around that the sending of invoices has become easier in the course of digitalisation and that a lot of money can be saved by turning away from the classical paper dispatch. But which technology is the right one for your company's individual requirements? In addition one must explain, which E-Invoicing actually exactly means. Because the term is interpreted very generously. Some even speak of sending an invoice as a PDF document by e-mail - regardless of whether the recipient then prints it out and treats it as a classic paper invoice. You want to send invoices (INVOIC)? The technology for this has existed for much longer than ZUGFeRD and the Tax Simplification Act: Electronic Data Interchange, EDI for short. Not the latest trend and as middleware technology with a somehow "technically complicated" image. However, the fact that EDI is much simpler and that there are now clear, easy-to-use tools available shows i‑effect®, the solution for electronic data exchange and data integration on IBM Power Systems. IBM i users can now start exchanging invoices without any problems, even in the high-end version. 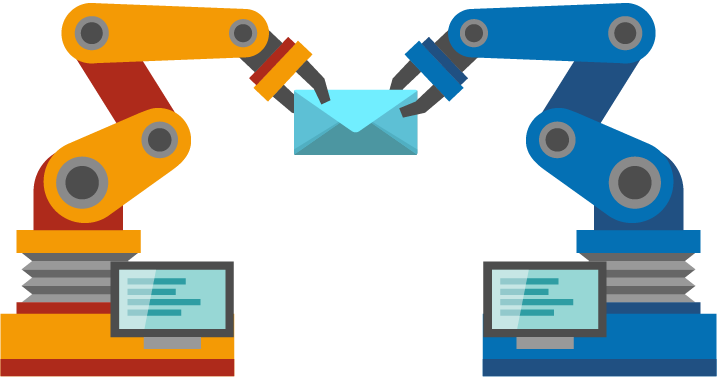 The EDI converter converts the sender's invoice information from its original format into a format that the recipient can process and then transmits this information electronically. The source is any interface format (database, XML, flat file, etc.). At IBM, for example, it is the DB2 database table. From there, the user moves the required fields (for example, invoice date, invoice number, invoice amount) in a graphical application to the middle area. This process can be imagined as a guide for the data. Here the data is adjusted as required (removing leading zeros, changing the date format, rounding...) and then converted, i.e. transformed from e.g. DB2 into an EDIFACT-INVOIC data structure. Finally, the EDIFACT file is sent via any communication protocol, e.g. via AS2 (Applicability Statement 2, a standard for secure message transport via the Internet). Moreover, the sender can always monitor the entire conversion and dispatch process in the browser using i‑effect® Webcontrol. It is obvious that such automated processes result in the true savings potential in electronic invoice processing - compared to all other forms of invoice transfer, including ZUGFeRD. Delivery is virtually time loss-free, there are no media breaks, the susceptibility to failure is minimal, as is personnel costs. All cash discount and payment deadlines are met and the company saves significantly on postage, paper and printing costs. In comparison: 11.10 € (4.50 €)[Z1] costs a conventional paper (electronic) invoice, if one adds all fixed and variable costs of the traditional invoice dispatch once together. The legal requirements are therefore in place: the Tax Simplification Act and the E-bill Act, which transposed the provisions of EU Directive 2014/55 of 16 April 2014 into national law (thus creating a binding legal basis for the receipt and processing of electronic invoices by public-sector customers). It can be assumed, for example, that in ten years' time incoming invoices will arrive almost completely in digital form in the company. The standard format for electronic invoices developed by the German government and industry, goes one step further: The carrier format here is a PDF/A-3 document. This means that the invoice can be displayed visually, but it also contains a data part in which structured data is embedded in a firmly defined XML format. The invoice recipient can electronically extract this data from the XML and process it automatically without manual effort. The current ZUGFeRD version 2.0 is called "Factur-X" at European level. This is a format for the exchange of hybrid invoices developed jointly between Germany and France. It complies with the standard for electronic invoicing (EN 16931) developed by the European Standards Organisation CEN. 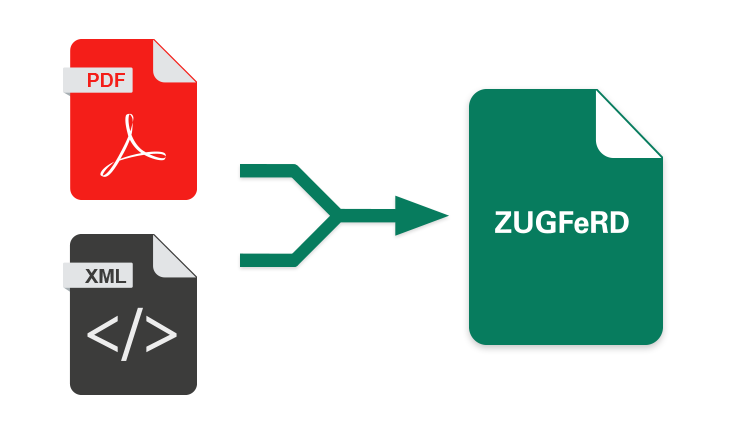 By the way: If you still rely on ZUGFeRD, i‑effect® also offers a solution for you: In the current version 2.7 there is the module *ZUGFeRD. Due to the seamless integration in i‑effect® and its modules, the data can be easily created for the invoice output and processed for the invoice receipt.